Aislinn Hoose is the daughter of Hal and Karen Hoose. Aislinn is currently in her sophomore year of High School, and has been running cross country for four years. In addition to cross country, Aislinn is also a member of the Hornet Swim and Track teams. In her free time, Aislinn enjoys baking, skiing, and traveling with her family. 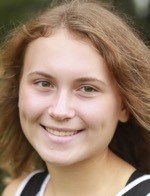 Hornet XC teams fall to Troy, Wyalusing. Perry finishes 2nd at District IV Championships to qualify for States. Hornets finish 5th at NTL Coaches Meet. CV boys, Mansfield girls earn pairs of XC wins. Hornet XC sweeps Towanda, Sayre. Perry finishes top 20 at NEPA Invite. Hornet XC teams sweep Canton, Sullivan County. Wellsboro XC girls top NEB; boys swept. Wellsboro XC boys split with Athens, Wyalusing; girls top Wyalusing. Hornets run at Lasagna Relays. Troy girls roll to NTL Invite repeat. Wyalusing boys, girls win Lasagna Invitational titles.